According to the song lyrics, “one bad apple don’t spoil the whole bunch, girl”. That’s true, unless your entire apple crop consisted of just one apple to begin with, as mine did this year. 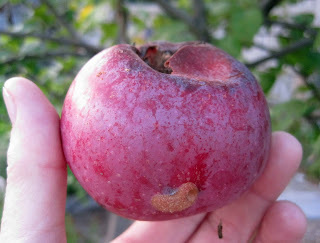 “Did” because the one apple on my one apple tree fell to the ground sometime in the last few days, rotten to the core. I picked it up and threw it in to the compost bin for the worms there to finish it off. Oddly enough, I felt like I was giving in to whatever it was that was rotting it out to begin with, letting them have the prize, rewarding them for attacking the apple in the first place. Truth is, I’m not all that upset. It is a Red Delicious variety, not my favorite by a long-shot. I only bought that variety because when I got the bright idea to plant a dwarf apple tree in the center of my vegetable garden, that’s what the garden center had. The tree has been planted in the garden for at least five years and in that time, I’ve gotten exactly two apples from it. It wasn’t always the tree’s fault, especially back in 2007 when we had a late frost at precisely the worst time, when the trees were in full bloom, so no apples formed in anyone’s garden or orchard, including mine. Now the question is how many more years do I give this tree before I cut it down and plant a variety I would like? There’s nothing wrong with the tree, and two years ago, when I tasted the apples from it, I was all set to keep it because the apples don't seem to be 'Red Delicious'. But it concerns me a bit to have a mystery apple variety. I think the answer is clear, “one bad apple has spoiled this whole bunch” and I should get some better apple trees soon. I think you should start over...with an apple you know will do well in your garden. Most of us have given in to that impulse of wanting it now and settling for less than what we hoped for. I think it's time to correct that mistake! My mistake was listening to the whole song. Now it's stuck in my head. I thought with apples it doesn't completely matter what variety they are because they will be open pollinated so you can never get a "true" Red Delicious as long as your tree is free to be, well, free. Anyways, I think you should give it another year or two just in case you get a good year with a real harvest and find out that you totally love your mystery apples. I am always in favor of keeping the big guys, though heartless with perennials. But if it's had a couple years maybe it will be established enough to give you a good crop soon... does this make me a perennial optimist? I have a mystery apple tree, too. I bought it since it looked healthier than the other labelled ones (it was from the previous year's stock). It has gone from the one apple to only a few last year, to dozens this year. So I'd recommend giving yours a chance, to see what it can do. I agree with Beckie, rip that tree out and get one you like. It doesn't look like a red delicious either. Funny, I hadn't thought of that Osmond song in a long time. I agree with the others, rip it out, cut it down, start over. Could the problem have been the fabled apple maggot fly? (Not that I know about it personally.) I don't know why I always thought this was a Jackson 5 song. My neighbor has two apple trees and there is always an excess. I was thinking a dwarf would be a good solution but now I'm unsure. I wouldn't get rid of it just because you don't know the apple variety. We inherited 3 apple trees when we moved here, and they make the best applesauce. I regret not knowing the variety name only because I would recommend these apples heartily to others if I knew what they were called. Well then. We only harvested one apple this year too. Our tree is not very old and we do live in North Florida.. I think I'll have to agree with the others who say to go ahead and rip the darn thing out. As much as I hate the idea of chopping down a tree, if it's not performing, you might as well invest your time and energy into a tree that will. Your site is quite a community builder. Kudos to you. And your posts inspire response. Glad you're out there. My blog is 4 days old, so I'm just getting my feet wet. I'm at www.secretcottagegarden.blogspot.com. I'm with them - rip it out! Life it too short to waste it on a tree that you think is rotten. I've had a little peach tree that produces only dead marbles for 4 years. Never peaches. I'm done. This fall -- OUT she comes. I have five apple trees and this year the few apples that set got eaten by the squirrels long before they could ripen. Dad gum it. Plant a variety you like, carol. And one the squirrels don't. If you figure out which that variety is, let me know, okay? You could change the variety of you tree by grafting and get good results very soon. It takes time to start all over again.